The air is thick with moisture and we sense it’s coming. Clouds build, the smell of rain envelopes, sunlight dims, and the flags are whipped by the wind. Thunder cracks and lightning flashes as we run for the nearest escape from the sideways water pelting our skin. The storm descends before we reach shelter and completely drenches us. A sudden, intense summer storm wreaked havoc on my daughter’s golf tournament last week and its impact was with us the rest of the day. As she golfed and I watched in our soaked clothing, the sensory experience is one I’ll never forget. I love the heightened sensations of a summer storm, but prefer to enjoy it from inside, not outside! But the sights, sounds, smells, and feel of that particular storm will always be a memorable moment in my #SummerToRemember. Our five senses of vision, hearing, smell, touch and taste help us to understand, navigate and remember the world around us. It’s said when one sense is diminished in one way, the others compensate. That is true, but we all can work to increase awareness of our sensory world and in the process, assist our memories of it. I recently had a memory flash filled with emotion and sensory stimuli. Seeing a similar situation unfold sparked the same emotions and feelings from years ago. Emotions and memories are tightly interwoven. Often what prompts and helps form memories is initiated from our senses. Notice the little things around you. The smells, sensations in our surroundings, tastes, or visual landmarks and cues–sensory stimuli are endless if only we notice them. Connect what we’re experiencing from our senses to the moment. The sweetness of the birthday cake, the familiar songs and the annoying bugs at the outdoor concert, or the rumbling thunder of an approaching storm are forever associated with that event. Connect the sensory input and you’ll have a trigger for the memory. Replay the moment. Whether it’s telling the story, reviewing it in our mind or writing it down, the repetitive nature of replaying it cements the memory. Watch for triggers and notice their impact. Some sad or painful memories are often cued by our senses. Pay attention and manage their impact to learn and grow. Noticing the sensory world and connecting moments will assist our memories. While it may not have been fun to be caught in a sudden storm, it certainly created an unforgettable moment. Take time in this #SummerToRemember to slow your pace and smell the roses (or the rain). 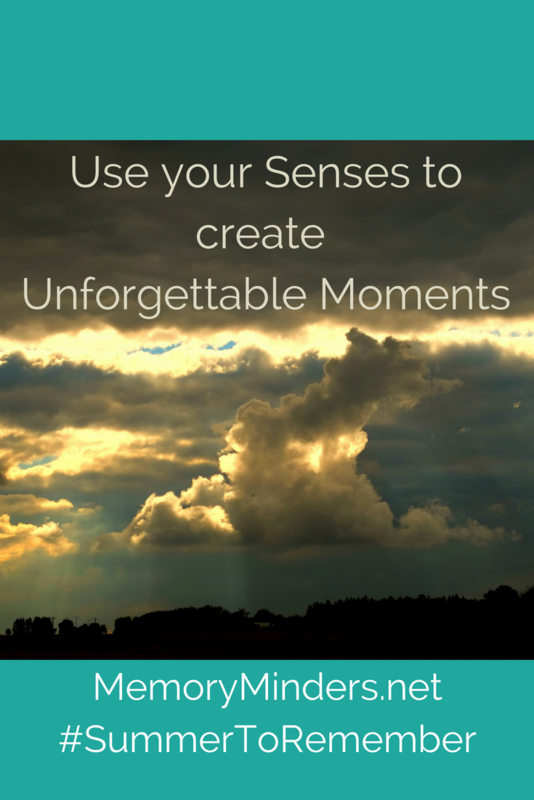 Pay attention to all your senses to enjoy every moment as it turns into a memory. I am taking the creative writing class at Alexian, and this week’s Memory Minders certainly gives me much “food for thought” about reflecting and writing. Thank you so much for a wonderful “spark”.